Office Space - Iver, Buckinghamshire. 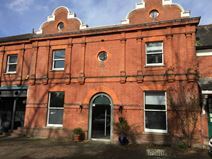 This space provides excellent on-site amenities including parking spaces, access to kitchen facilities, private, rural grounds and office cleaning. The location is less than four miles away from Slough, and just 19 miles from the centre of London. The local town centre offers many amenities, such as a post office, a hotel and various pubs and restaurants. Surrounding the centre are bus stops, providing good transport links.